Stocks closed broadly lower in choppy trading after the Federal Reserve raised interest rates for the fourth time this year and said more hikes were on the way given the strength of the economy. The Fed’s decision Wednesday, and comments by Fed Chairman Jerome Powell, didn’t go as far as some investors had hoped in signaling a sharper slowdown in rate increases. The Dow Jones Industrial Average went from a gain of 381 to a loss of 351 points, its latest abrupt swing lower in recent days. The Dow closed with a loss of about 1.5 percent. The S&P 500 index, a broader measure, also lost 1.5 percent, falling 39 points to 2,506. The Nasdaq composite fell 147 points, or 2.2 percent, to 6,636. Stocks turned sharply lower in afternoon trading, giving up an early rally, after the Federal Reserve raised interest rates and said more rate hikes are possible next year given the strength of the economy. The Fed’s decision Wednesday, and comments afterward by Fed Chairman Jerome Powell, may not have gone as far as investors were hoping in signaling a sharper slowdown in interest rate increases. The Dow Jones Industrial Average was down 482 points in afternoon trading, or 2.1 percent, at 23,209. It was up as much as 381 points before the Fed’s announcement. The S&P 500 was also down about 2 percent. The Nasdaq composite was off 2.9 percent. Bond prices rose, sending long-term yields lower. The yield on the 10-year Treasury note fell to 2.76 percent from 2.83 percent. Stocks gave up an early rally and moved lower in afternoon trading as investors reacted to the Federal Reserve’s latest interest rate plans. 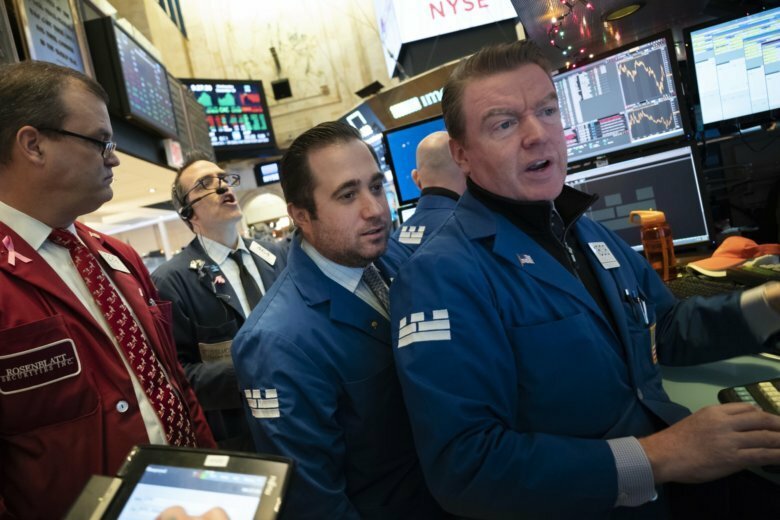 The Dow Jones Industrial Average immediately gave up a gain of about 300 points and was little changed in the minutes after the Fed released its statement Wednesday. The Fed, as expected, raised its benchmark interest rate by a quarter point. Policymakers also said they expect to hike rates just twice next year, down from a previous forecast of three. A partial recovery in oil prices is pulling energy companies higher following huge losses a day earlier. The Dow was up 43 points, or 0.1 percent, to 23,697. The S&P 500 index was little changed at 2,548. The Nasdaq fell 29 points, 0.4 percent, to 6,754. Stocks are higher on Wall Street as energy companies benefit from a partial recovery in oil prices following a huge loss the day before. GlaxoSmithKline jumped 3.1 percent Wednesday after agreeing to combine its consumer product business with Pfizer’s. FedEx plunged 10 percent after the company said international shipping fell in the latest quarter. Facebook fell 2.3 percent after the New York Times reported that it gave big technology companies far more access to users’ personal data than it has previously said. Trading was quiet as the Federal Reserve wraps up its last meeting of the year. The S&P 500 rose 21 points, or 0.8 percent, to 2,567. The Dow Jones Industrial Average rose 210 points, or 0.9 percent, to 23,885. The Nasdaq added 55 points, 0.8 percent, to 6,839. Stocks are opening higher on Wall Street and oil prices are climbing back after a huge drop the day before. Trading was relatively subdued early Wednesday ahead of an interest rate policy announcement by the Federal Reserve. The Fed is expected to raise its benchmark interest rate by a quarter percentage point. General Mills jumped 7.1 percent after the cereal maker reported strong quarterly results. The U.S.-listed shares of drugmaker GlaxoSmithKline rose 3.9 percent after announcing a deal to combine its consumer products business with Pfizer’s. The S&P 500 index rose 6 points, or 0.2 percent, to 2,552. The Dow Jones Industrial Average rose 62 points, or 0.3 percent, to 23,739. The Nasdaq composite added 22 points, or 0.3 percent, to 6,806.